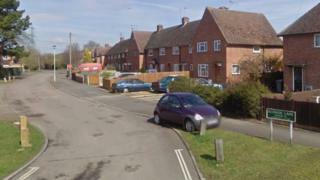 A 30-year-old man has been arrested on suspicion of murder following the death of a woman in Berkshire. Police were called to reports a 28-year-old woman was seriously injured inside a home in Blossom Lane, Theale, at 00:53 BST on Thursday. She was pronounced dead at the scene, but is yet to be formally identified. Det Ch Insp Ailsa Kent said: "I believe this to be a domestic incident and there is no threat to anyone in the community." The man remains in custody.